With weather warming up in most of the United States insects become more active. One good thing about cold weather is that insect populations go dormant. In Florida it is warm all year round and the insect populations are always high. Mosquitoes in Florida are ever present and down here they are about the size of a porcupine. Stinging insects that bother dogs and cats also cause problems in humans. When referring to stinging insects I am referring to wasps such as yellow jackets and bumble bees. Honey bees can also occasionally sting pets. Other stinging insects that can cause pain and allergic reactions are fire ants and spiders. Stinging insects such as wasps serve a function in the big scheme of things. In Ohio I was a beekeeper since 1987. After caring for them for years I learned that if you don’t bother them they won’t bother you. 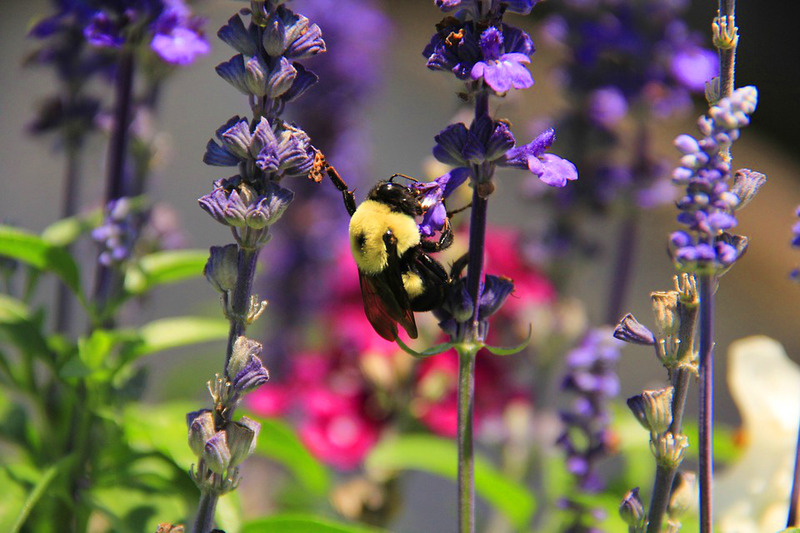 Bumble bees (shown in the above picture) and honey bees are nature’s natural pollinators. Without them we would not have the fruits and foods that we enjoy today. Imagine no pumpkins at Halloween time. Honey bees are like people; they do not like to go out in rainy weather. Pollination is minimal but bumble bees are out in full force pollinating in rainy weather. The populations of yellow jackets peak around early September and mid October. When not bothering people during outdoor activities they clean up environmental detritus such as other dying insects. They sanitize the environment in their own little way. Fire ants are a big problem in Florida and the southern states of this country. Fire ants live in colonies in the ground. Spiders, such as the black widow, love to hide in wood piles or stacks of wood to be burned during the upcoming winter. Many stinging insects that cause pain in dogs live in hives underground. Yellow jackets can live in gigantic colonies in yards. What gets people into trouble is running a mower over a nest. Noise and vibration stimulate wasps to seek and attack the “intruder”. This can be very dangerous. 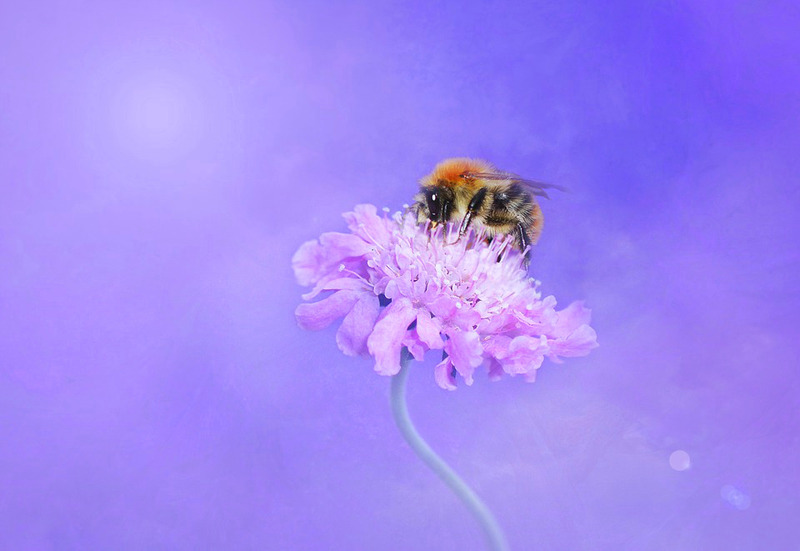 Bumble bees live underground in small colonies of about 30 individuals. Honey bees due not live underground. In nature they live in tree hollows and build bees wax where they raise their young and store their honey. WHERE DO DOGS AND CATS FIT IN? Dogs and cats are curious by nature. They root around and often get into trouble. Dogs live with their noses to the ground. That nose could possibly run over a yellow jacket colony in the ground or a spider in a wood pile. There is nothing wrong about being curious but not knowing what you are doing can be risky business. The most common way that dogs and cats are stung is by swatting at the insect with their paws or by trying to bite at it. This leads to stinging insect bites around the fore paw and inside the mouth. Fire ants are all over the place. All a dog has to do is just stand in a yard where they are prevalent and they will immediately attach to the animal and start biting. Honey bees rarely cause problems unless you are a beekeeper bothering them on a hot, humid summer day! Bees fly way above humans and pets. I remember as a kid walking through a clover patch in bare feet! I learned my lesson quickly! Dogs can also get stung by a honeybee. In nature the biggest fear that honeybees have is the black bear. They will sting anything that is wearing black. Honey bees only sting one time, lose their stinger and die. Yellow jackets are stinging insects that do not lose their stinger after biting a human or a pet. They can sting over and over and over again. The sting of a yellow jacket causes intense pain in dogs and cats. When most people call and say their pet was stung by a “bee” they usually mean a wasp such as a yellow jacket, bumble bee or other stinging insects. Unless stepped on honey bees are not aggressive. The exception to that is Florida and other sunbelt states where the Africanized honeybee has taken up residence. 75% of honey bee colonies in Florida are Africanized. They are very aggressive. It is too cold up north in the winter for Africanized bees to exist. Getting stung by stinging insects is serious business. The sting hurts dogs and cats but the dangerous part is not knowing how severe the allergic reactionInsects are not the only cause of an allergic reaction. Fleas, parasites, foods, grasses and other pollens cause many types of problems. What can cause severe reactions in one animal often do not cause an medical issue in another animal; even if they are siblings. What makes medicine so hard is that every individual on this planet is different. will be. All animals are individuals and react differently to allergies in the environment or food for that matter. Some animals do not react while others develop life threatening allergic reactions known as an anaphylactic reaction. These overwhelm the animal’s immune system often leading to death if medical intervention is not sought. Most dogs and cats that are stung will present with swellings around their paws, eyes, nose or oral cavity. Some animals will be covered in welts (urticaria) all over their bodies. You may hear the pet yelp or cry out if it is near. The allergic reaction releases histamine which triggers the allergic reaction. Dogs and cats will generally scratch at various parts of their bodies. Animals that are being bitten by ants will be in agony as each ant has teeth that bite. They will roll around in the grass trying to extricate themselves from what is biting them. This is abnormal behavior so always check out the animal. 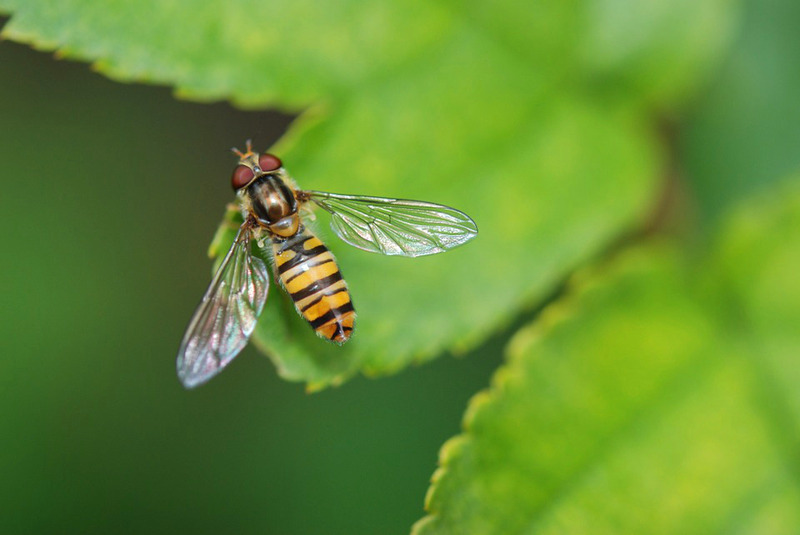 Most animals become miserable after a bout with stinging insects. One of the best medications to keep around is Benedryl® (diphenhydramine HCL). The sooner you give an antihistamine to an animal the better off it will be. This class of drugs work best right after an animal is stung. The effect is negligible if given hours after the allergic reaction. Call your veterinarian or emergency clinic for an appropriate dose for your dog. I do not advise Dramamine® (dimenhydramine HCL) or Benedryl® for cats. Many antihistamines have an excitability factor in felines. One safe antihistamine to use in cats is Zyrtec® (cetirizine). It is now available in a generic OTC version which makes dosing much cheaper. If you are in any doubt take your pet to an animal emergency clinic. Dogs may seizure, collapse or have respiratory distress at any moment. If something BAD happens it is better for the animal to be in a hospital. Most animals are given antihistamines, adrenalin and corticosteroids by injection to stop the allergic reaction. Some animals require oxygen therapy. Other signs are treated as necessary and the animal is eventually discharged. Some pets need antibiotics for secondary skin bacterial infections secondary to severe damage to the skin from constant scratching. 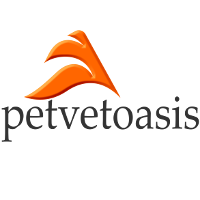 The best way to remove ants from dogs is by using a suitable pyrethrin or permethrin flea spray on dogs. DO NOT USE PERMETHRINS ON CATS! They will cause neurological side effects. Stick with pyrethrin sprays on cats. They can also be picked off the pet using a gloved hand. The object here is to not get bit so use gloves. Stinging insects like fire ants hate water. You might want to bathe or hose the animal down to rid it of ants but the water will make the ants even more aggressive. Once the animal has been treated for stinging insects it is prudent to bathe the animal in an oatmeal shampoo which will soothe and rehydrate irritated skin. Episoothe® from Virbac is one of the best products around. One of the best means of preventing stinging insects is by keeping both dogs and cats inside the home. A fenced in yard will keep dogs from wandering around where they can get into trouble. Periodically walk your property checking for yellow jacket or fire ant nests. For control of these use a professional exterminator. It is not worth risking getting bit while trying to treat the problem yourself. Spiders love to hide in wood piles so eliminate them or at least cover them up with a tarp to keep curious pets away. There is no one way to prevent 100% of stinging insects from biting your pets. We would all have to live on the moon for that to be possible. Keep safe antihistamines in the medicine cabinet just in case your dog or cat is stung.